SPRINGFIELD, Mass. – Cole Anthony didn’t make an appearance in Oak Hill’s game here at Springfield College in the HoopHall Classic against IMG Academy on Sunday night. But the 2019 five-star point guard was hard to miss. Anthony, who was sidelined with a sprained ankle, was spotted doing a baseline interview with ESPN during the game prior and a sit-down interview with the ESPN announcers during the Oak Hill-IMG matchup, but what mattered most to Steve Smith was Anthony’s presence on the bench, encouraging his teammates. “Most guys sitting out, you’d say, ‘Hey, you’ve got to be a good teammate,’” the Oak Hill head coach said afterward. “I knew he was going to be the best guy on the bench. That’s just how he is. But as good as the 6-foot-3 Anthony is as a leader on the bench, he’s a better player on the court and Oak Hill could have used him as it came up short against IMG, losing 72-67. “He’s a high character kid,” Smith said. “One thing he does that people don’t even notice is he plays so hard all of the time. We needed him out there tonight to give us a lift. The big question now is where will that be. “His family said he wants to commit somewhere around Final Four weekend,” said Smith. 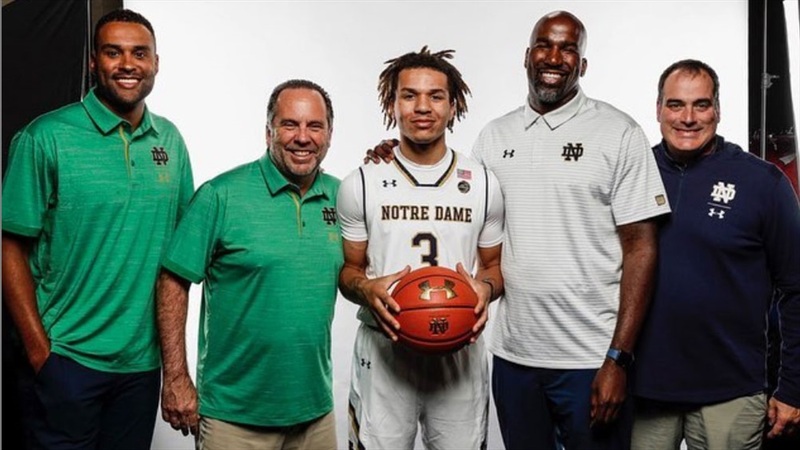 During the summer, Notre Dame emerged as a contender for a player rated among the top two or three in the country and Smith says that hasn’t changed. “Notre Dame is very involved,” the coach said. “They were in this past week. Smith pointed to Anthony’s comfort level with the staff in South Bend. But the research isn’t finished yet. “He and his dad both have been looking at games, watching film of the schools on his list,” said Smith, referring to Anthony’s father, former UNLV and NBA standout Greg Anthony. Georgetown is the other school that made Anthony’s top six. But wherever Anthony ends up, Smith – and just about everybody else for that matter – is confident he’ll succeed.